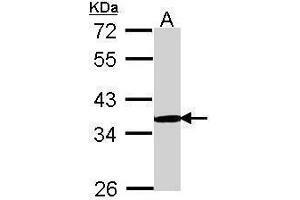 ICC/IF Image PSMD11 antibody [C1C3] detects PSMD11 protein at nucleus and cytoplasm by immunofluorescent analysis. Sample: A549 cells were fixed in 4% paraformaldehyde at RT for 15 min. 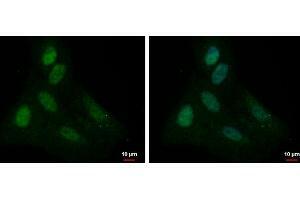 Green: PSMD11 protein stained by PSMD11 antibody [C1C3] , diluted at 1:500. Blue: Hoechst 33342 staining. 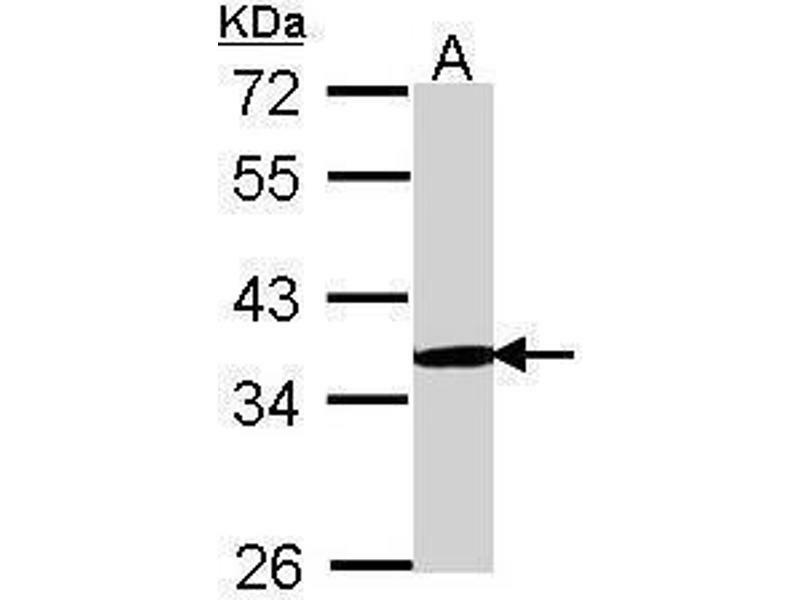 免疫原 Recombinant protein encompassing a sequence within the C-terminus region of human PSMD11. The exact sequence is proprietary. 背景 The 26S proteasome is a multicatalytic proteinase complex with a highly ordered structure composed of 2 complexes, a 20S core and a 19S regulator. The 20S core is composed of 4 rings of 28 non-identical subunits, 2 rings are composed of 7 alpha subunits and 2 rings are composed of 7 beta subunits. The 19S regulator is composed of a base, which contains 6 ATPase subunits and 2 non-ATPase subunits, and a lid, which contains up to 10 non-ATPase subunits. Proteasomes are distributed throughout eukaryotic cells at a high concentration and cleave peptides in an ATP/ubiquitin-dependent process in a non-lysosomal pathway. An essential function of a modified proteasome, the immunoproteasome, is the processing of class I MHC peptides. This gene encodes a non-ATPase subunit of the 19S regulator. 缓冲液 1XPBS, 10 % Glycerol ( pH 7). 0.01 % Thimerosal was added as a preservative.